If this card is sent to the Graveyard for a Synchro Summon: You can target 1 Level 4 or lower Zombie-Type monster in your Graveyard; Special Summon that target. This monster is based on bull mummification in ancient Egypt, where they sacrificed bulls and mummified them in honor of Apis. If "Urgent Tuning" is activated at Chain Link 2 or higher so that you Synchro Summon in the middle of a Chain and "Beast of the Pharaoh" was one of the Synchro Material Monsters, then you can activate the effect of "Beast of the Pharaoh" after the Chain finishes resolving, without having its effect miss the timing. : If "Beast of the Pharaoh" is used as a Synchro Material Monster in the middle of resolving a Chain, then can its effect be activated without missing the timing? If "Nitro Synchron" is used as a Synchro Material Monster because "Urgent Tuning" is activated at Chain Link 2+ to Synchro Summon a monster in the middle of resolving a Chain, then the effect of "Nitro Synchron" activates after the current Chain finishes resolving, without missing the timing. Similarly, if "Sinister Sprocket" or "Beast of the Pharaoh" is used for a Synchro Summon in the middle of resolving a Chain, then its optional effect can be activated after the current Chain resolves, without missing the timing. : If you Synchro Summon at Chain Link 2+, then can you activate the effect of a "Nitro Synchron" which was used as a Synchro Material? If "Beast of the Pharaoh" was sent from the hand to the Graveyard because it was used as a Synchro Material Monster for a Synchro Summon along with "Eccentric Boy", then the effect of "Beast of the Pharaoh" may be activated. : If "Eccentric Boy" and a "Beast of the Pharaoh" in the hand are used as Synchro Material Monsters, then can the effect of "Beast of the Pharaoh" be activated? 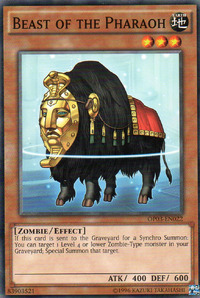 "Beast of the Pharaoh's" effect targets 1 Level 4 or lower Zombie-Type monster in your Graveyard.